Ah, Alfredo Aceves. You used to be the pitcher who induced sighs of relief in Red Sox fans, nobly plying your craft in any and all innings with equal aplomb. 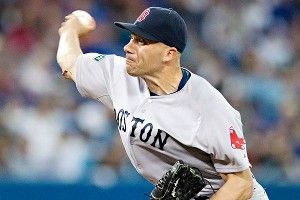 Aceves was perhaps the only Red Sox pitcher from 2011 to escape the disastrous fall months with his reputation intact; he even pitched a scoreless inning during Game 162, a brief respite before the entire East Coast began to burn. If you told me that Aceves went up to the starting rotation and said, “Hey, guys, maybe people will go out of their way to twist this whole eating-fried-chicken thing into an unfair narrative about any possible collapse we might be about to have, so let’s cut it out,” I would believe you implicitly. He was the swingman who could do no wrong. Well, six appearances later, let’s all band together to throw him on the scrap heap, right? With Mark Melancon banished to Pawtucket, Aceves now stands as the obvious example of what’s gone wrong in the Boston bullpen, a label he affixed to himself with superglue after the five-run, four-walk, no-outs appearance that confirmed a dramatic Yankees comeback on Saturday afternoon. The season is far from over, of course, but it’s reasonable to start the inquiry into whether Aceves is — or ever was — the right man to be at the helm of the Boston bullpen. That’s a pretty clear trend. During his four seasons at the major league level, Aceves has consistently put up an ERA that was far superior to what his strikeout, walk, and home run ratios would suggest. The Aceves the numbers expect to eventually arrive is a replacement-level scrub, but the guy who keeps showing up on the mound is some sort of super-swingman. What gives? Aceves’s secret to avoiding BABIP-induced regression? Pop-ups. If you’re going to put balls in play, you want to induce as many pop-ups as possible, since they get turned into outs far more frequently than any other type of batted ball. Before this year, Aceves had produced pop-ups on 19 percent of his balls in play, well above the league average of 13 percent. Last year, in a park that’s extremely friendly to fly-ball hitters, Aceves’s pop-up rate was at a whopping 22 percent. This year? Not so much. Aceves hasn’t induced even one pop-up in his six appearances. Sure, it’s only been 20 batters and 10 balls in play, but you would have thought he could pull one lousy pop-up out of his hat by now, right? His BABIP over those six appearances is a terrifying .500. It’s not that Aceves doesn’t resemble the 2011 version through six games; he doesn’t resemble the player that he’s looked like throughout his entire career. That’s a disappointing sign. You would like to think that Aceves will right the ship and continue to produce those lazy infield fly balls that produce easy outs, but there’s a variety of reasons why he might not actually possess that skill. For one, sabermetricians haven’t found evidence that pitchers are able to maintain their pop-up rates from season to season. Even more disconcerting for Red Sox fans is the idea that we might not really know what Alfredo Aceves is at all. While Aceves has been in the majors for four years now, a back injury in 2010 forced him to miss most of the season. Our brains think of Aceves as a veteran who has proven himself over multiple seasons, but the reality is that he had only thrown 240 innings at the major league level before this season. What he’s done could be no different from a player like Joe Mays, who posted a 3.16 ERA in 233⅔ innings in 2001 on the back of a .246 BABIP and failed to ever reach those figures again. It’s easy to tag Mays as a fluke because it was a single season during the middle of his career, but we might also have just witnessed 240 innings from Alfredo Aceves that wildly exaggerate his true talent level, only convincing ourselves that he’s the real deal because those innings are spread over multiple seasons. Pop-ups or no pop-ups, there’s just not a great track record of players like Aceves sustaining a low BABIP over the course of their careers. Since 1990, only eight other players have sustained a BABIP under .250 over the course of their major league careers, and seven of them were fireballers who struck out 8.3 batters per nine innings or more. The only player besides Aceves to post a low BABIP without getting many strikeouts over his career is Rays starter Jeremy Hellickson, who has only thrown 244 innings over three seasons and has publicly scoffed at the idea of a BABIP correction. And only one player over the past 22 years has produced a lower BABIP than Aceves while facing more hitters over a four-year stretch: Troy Percival, who did it from 1995-98. (Mike Adams comes close over the past four seasons.) Does Aceves really have Troy Percival-in-his-prime stuff? Or are we fooling ourselves into believing that he can imitate Percival’s results from a small sample? So how can Aceves start forcing more pop-ups? One suggestion is to re-diversify his pitch selection. As mentioned, Aceves’s stuff doesn’t bear much of a resemblance to the sort of two-pitch, velocity-heavy assortments associated with the traditional closer. When many starters move into relief and/or become closers, they start scrapping their weakest pitches to focus exclusively on their better ones, and since they don’t face the same batter more than once per game, they don’t need to use those secondary options. Aceves threw a variety of pitches as a starter and swingman, but during his brief time as Red Sox closer, he’s become almost entirely attached to his fastball. This year, according to the work done analyzing pitches by MLB’s Pitch F/X program and the folks at Brooks Baseball, Aceves has thrown his four-seam fastball just under 50 percent of the time. Last year, he threw the four-seamer 33 percent of the time, drawing pop-ups on 13 percent of those pitches. There’s been a rise in his average fastball speed from 93.3 miles per hour to 95.5, which is to be expected when moving from a multi-inning role to that of a single-inning reliever, but that increase in velocity hasn’t produced results. On the other hand, there’s a third explanation for why Aceves has struggled as Red Sox closer: It’s been six freaking appearances. He’s faced 20 batters and thrown a grand total of 93 pitches. Just as we argued earlier that Aceves’s four-season sample was actually smaller than it seemed, how would you feel about Aceves as a starter if he went out on the third day of the season and was shelled for eight runs in three innings before being yanked from the game? It would be a disappointing start, sure, but it wouldn’t be time to remove Aceves from the rotation. That’s exactly what the organization would be doing if they took Aceves out of the closer’s role now, and it wouldn’t be entirely fair. Aceves very obviously isn’t going to be this bad the entire season. He won’t post a .500 BABIP. He won’t allow 70 percent of runners who reach base to score after allowing just 25 percent of them to score over his career. He won’t allow home runs on 25 percent of his fly balls. He’ll get better. The question for the Red Sox, though, is this: Is Alfredo Aceves ever going to be the pitcher that the organization depended upon so heavily in 2011 again? Even if we write off his messy opening two weeks as an aberration, there are reasons to doubt that last year’s stopper will be this year’s solution.